Prime Minister Narendra Modi on 8 September expressed deep concern with the rising export of terror and also sought a coordinated response from ASEAN members to combat the threat. "Export of terror, growing radicalisation and spread of extreme violence are common security threats to our societies," he said while addressing the 14th ASEAN-India summit in Vientiane. His remarks have come as an apparent attack on Pakistan. "The threat is local, regional, and transitional at the same time. Our partnership with ASEAN seeks to craft a response through coordination, cooperation at multiple levels," PM Modi added. He said that in the face of growing traditional and non traditional challenges, political cooperation has emerged as key in relations. "We are willing to take concrete steps to enhance cooperation in cyber security, de-radicalisation and counter-terrorism," he said. In his remarks today, the Prime Minister said ASEAN is central to India's Act East policy. "Our engagement driven by common priorities bringing peace, stability and prosperity to the region," he told the 10-member grouping attended by Heads of State. He said enhancing connectivity was central to India's partnership with ASEAN. "Seamless digital connectivity between India and Southeast Asia is a shared objective. 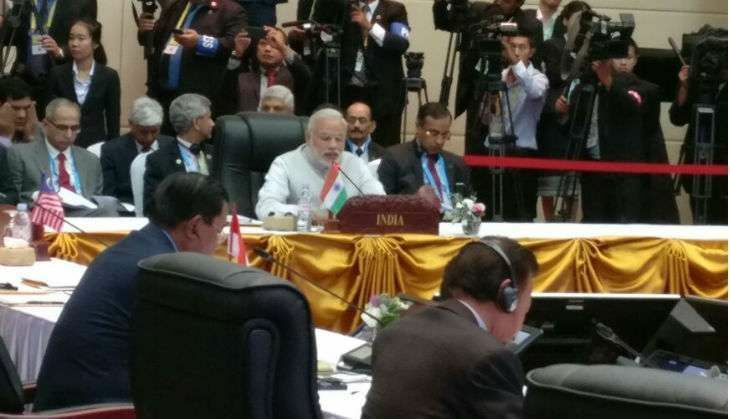 India committed to Master Plan on ASEAN Connectivity," Modi said. Securing seas was a shared responsibility, he said, adding that sea lanes are "life lines of global trade". India supports freedom of navigation based on United Nations Convention on the Law of the Sea (UNCLOS), he added. He thanked the member countries for sharing their views on "nature, direction and priorities of our engagement". "All three pillars of our partnership - security, economic and socio-cultural have registered good progress," he said, adding that engagement of India-ASEAN is of "economic optimism".